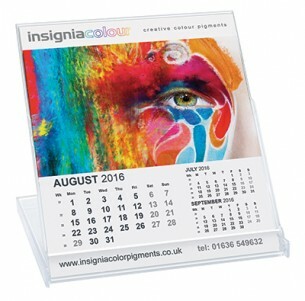 For a novelty branded gift that is also incredibly useful, consider the printed Smart Calendar - CD Case Shrinkwrapped. This small calendar is designed in the size of a classic CD case, and it sits on the desk or table and opens up to provide a month's view at a glance. Your branding is clearly displayed above the dates so it can't be missed. This would be useful for secretaries or any office workers who regularly need to check the date, making it a great idea for a branded giveaway. Your branding will be printed with litho or digital printing.